Did you see the news about a Japanese billionaire announcing his intentions to travel to the moon with SpaceX? Actually, it seems more like a travel “around the moon” rather than “to the moon” because their plan is to circle the moon without landing on it. According to the SpaceX CEO, the e-commerce entrepreneur has already put down a significant deposit. They didn’t give us concrete numbers, but you can tell the plan involves a lot of money. Now, when you talk about something very big like building a rocket to the moon, you probably want to have words like huge and enormous. They both mean “very big”. 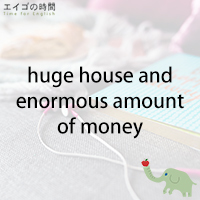 For example, you have a huge house. It has 20 rooms. Building a spaceship will certainly cost an enormous amount of money. And the cost of flying to the moon must be astronomical! Now, would you like to try a quiz? You’ll be given three options. Please listen carefully and choose the one that is NOT true. Ready?